George Frideric Handel (German: Georg Friedrich Händel) (janam: Halle, Germany, 23 February 1685; maut: London, England, 14 April 1759) ek German composer rahaa, jon ki aapan jawaani ke time England me jaae ke rahaa  Baad me uu ek British citizen ban gais rahaa. Johann Sebastian Bach aur Handel ekke saal me paida bhain rahaa. Ii logan appan jamanke sab se achchhaa composer rahin lekin ek dusre se kabhi nai milin rahaa. Jab Handel British citizen banaa tab uu aapan naam ke badal ke George Frideric Handel kar diis. Jab ki duuno Baroque ke jamana me rahin, uu logan ke music developed differently. 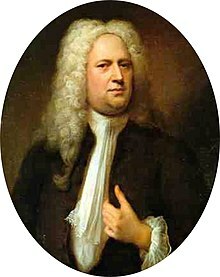 Handel wrote many operas and oratorios and by them became very famous. He took many trips, including to Italy where he learned a lot about composition. Bach never left central Germany, and most of the time he was a church musician who was not well-known by the general public. Handel wrote over 40 operas. Later he wrote oratorios. His most famous oratorio is the Messiah . He wrote anthems, chamber music and orchestral music including the Water Music and Music for the Royal Fireworks.